Livingston County Sheriff Thomas J. Dougherty proudly announces that 13 young people from Livingston County left on Sunday July 9th for the New York State Sheriffs’ Institute 2017 Summer Camp and returned on Saturday July 15th. The young campers attended Camp Iroquois, located on Keuka Lake in the Finger Lakes Region of Yates County, for a week of wholesome summer fun. Sheriff’s Investigator Gene Chichester traveled with the campers to serve as their counselor for the week. Now in its 41st year of operation, the camp will accommodate over 900 boys and girls between the ages of 9 and 12 from across New York State this summer. The campers attend at no charge. Made possible by the generous financial support of the Honorary Members of the Sheriffs’ Institute, the Sheriffs’ Summer Camp provides a solid recreational program while stressing basic values and good citizenship. Campers participate in typical camp activities, like archery, sailing, boating, hiking, and talent shows. They also experience technical and safety demonstrations by Deputy Sheriffs such as scuba diving, K-9 handling, bicycle safety and boating safety. 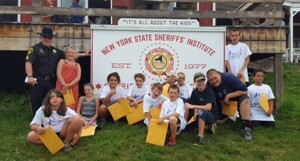 The Sheriffs’ Summer Camp is a program of the New York State Sheriffs’ Institute, Inc. The Sheriffs’ Institute was established in 1979 with the mission to assist the Office of the Sheriff in advancing education in the criminal justice community, preventing juvenile delinquency, and supporting victims of crime and their families. Visit www.nysheriffsinstitute.org to learn more.